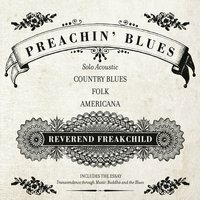 With just harp, National Steel guitar and his voice, the Rev keeps it simple on Preachin’ Blues, recorded live for broadcast on KBOO in Portland, Oregon. The result is not only the most authentic blues/ gospel you’ll hear, but one of my top 5 blues albums of all time. Living Blues Magazine says “His attitude is irreverent, but his enthusiasm for the blues is clear”, and judging from the patter between songs, he gets the connection between gospel and blues- what the bio refers to as “some mellow meaningful preachin’ in between tunes.” Prior to this gig, all of Freakchild’s guitars and gear was stolen in San Francisco but, with more tour dates on the hook, he picked up another guitar and just kept on going. Included along side his originals are songs originally cut by Son House, Blind Lemon Jefferson and, as he had just died, Prince’s Kiss. As you listen, it’s obvious that he’s playing to and off a group of people listening and watching from the sound booth. His guitar playing has the casual grace of someone to whom this kind of music is second nature, and he’s a solid harp player too. Preachin’ Blues is as much a spiritual experience as it is a stunning blues album, and no doubt you’ll enjoy the heartfelt academic essay that the Rev wrote (included on the enhanced cd) called Transcendence Through Music: Buddha And The Blues- it’s a wonderful read. Unusual to find a record I like this much this early into a new year, but Preachin’ Blues will be a tough one to beat for 2017’s top spot.